Are you a Kroger shopper? Kroger is committed to helping our communities grow and prosper. Year after year, Kroger donates millions of dollars through Kroger Community Rewards to local organizations, and Habitat is one of those recipients, thanks to local supporters who link their Kroger Plus Shoppers Card to Habitat for Humanity of Grayson County. Kroger Community Rewards makes fund-raising easy…all you have to do is shop at Kroger and swipe your Plus Card! To enroll, visit Kroger’s website at www.KrogerCommunityRewards.com to set up an account, register your Kroger Plus Card, and link your card to Habitat for Humanity. Anytime you shop at Kroger using your card, you will accumulate points for Habitat. Our group number is QD516. (Please make note of the NEW Account Number!) 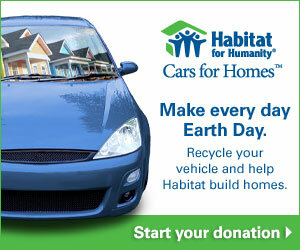 Linking your card to Habitat does not affect your in-store or gas discounts! We have been a part of the Kroger Rewards program since 1995 and have received more than $30,000 in funding thanks to Kroger and Habitat supporters. Please register your Kroger Plus card online today. A new Habitat house is underway! Photos from the groundbreaking ceremony for Jose and Christina’s home showed a family surrounded by supportive relatives and great volunteers. Amazon + Habitat = Lots of Smiles! Millions of people are Amazon shoppers! The new AmazonSmiles program provides a way for Amazon to give back a portion (0.5%) of your shopping dollar to the charity of your choice. Here’s how it works: When you want to make a purchase at Amazon, don’t go to amazon.com! Instead, go to www.smile.amazon.com. You will be asked which charity you want to support. Type in Habitat for Humanity of Grayson County. Then, shop as usual. Everything else about shopping is the same– your discounts, free shipping, and any of your other perks. We will receive a check once a quarter based on supporters’ purchases. You might want to bookmark it! Diana Cosby’s – Romance Readers Build A House! There’s almost nothing better than curling up with a good book on a chilly day, especially with one of Diana Cosby’s romantic suspense novels set in medieval Scotland. But one thing even better is building a warm, safe, and secure Habitat house for a deserving family. It gives families more than just a home; it provides a foundation on which to start their future and build their dreams. Diana’s readers are working to build such a house. As readers send contributions to Habitat for Humanity of Grayson County, watch the bookshelf fill with every donation. The goal is to fund an entire home – $55,000, in order to start construction on a new house of dreams. Click the house to send your donation via PayPal, or donate funds the old-fashioned way—a check works just fine! Total raised so far: $18,347! FYI: The click on the gray zeroes on the PayPal form and type. Your amount will replace the zeroes as you enter your donation amount. Send checks to Habitat for Humanity of Grayson County, P.O. Box 2725, Sherman, TX 75091.